How old can one be to start skiing? Probably more important than one's age in answering this question is one's health, history of body injuries, and conditioning. Surely a doctor's advice is useful; but here's a tip--get your evaluation from a doctor who is older and a skier. I started two non-skiers into the sport who were 72 at the time. Each was able to ski green slopes and groomed easy blue slopes after several sessions during one season. But then there was the lady who said, when asked why her mother wasn't also skiing, "Oh, she's too old." Of course I asked how old? "62! ", came the answer (I was about 70 at the time). Attitude counts. Avoid using the age excuse unless there are added factors. There are ski instructors who did not start skiing until they were in their '50s, and at least one who was in his '60s when he learned to ski. Some have reached their full level of certification after reaching age 60 (including me). How long can one keep skiing? I know of two ski instructors who in 2015 are 85 and are still teaching! And another who is 87. And there is the famous "Jackrabbit Johansen" who would still go out on cross-country skis at the age of 111! Don't count on that, however. Still, many skiers remain active in their sport into their early '80s. 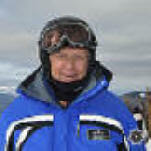 A ski school director in California was nearly 80 after having taught and directed for 50 years. Watch the Masters Racing Program some time and note the older entrants; there is a division for ages 80 and over. Recently a skier in the 75-79 year age class recorded the fastest times of the day, and not by handicap but by the actual clock. The NASTAR racing program's top age category is 95+. One skier I have used as an example in illustrating an answer to this question is Freda Langell Nieters. 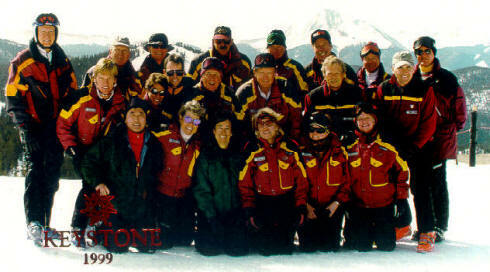 The article below reports her induction into the Colorado Ski Hall of Fame in 2009. When Freda was 75 she skied down 75,000 vertical feet in one day (involving over 30 lift rides) to raise money for research on Sudden Infant Death Syndrome, having lost a grandson to that malady. Today, several years later, Freda still teaches. Another Norwegian, Stein Eriksen, was still skiing at 88. The Over-the Hill Gang only admits skiers over 50 years and has a 70 degree division for those over that number in years. Elderhostel has programs for older skiers, too. Once I led such a group and it was the fastest bunch I had all that season. Why would an older person want to ski? Read what 69-year old ski racer Larry Young has to say: "We train for various reasons. Some to become better basic skiers, some to avoid getting worse, some to win cups and some to recover the dreams of youth. We train (and some of us race) for the pleasure of working hard to attain something difficult, in a healthy, beautiful and supportive environment...We learn and unlearn ski racing techniques as equipment and methods evolve...We lift weights and bike hard in August to be stronger skiers in December. We enjoy winning - but most of all we love to meet our own growing standards of what we can achieve. We know that on average we are getting slower (0.5% per year over 30 for GS and 1% per year for Slalom according to the Rocky Mountain Masters) but we each try to push forward a bit. By competing in age groups the pursuit remains reasonable and fun. Ski Racing is a lifelong sport and remember, it is not the destination but the voyage that matters!" WOLF CREEK PASS, Colo.--Charles Elliott's doctor never called back to give him permission, but with a forecast of sunny skies and 5 feet of fresh snow, the 96-year-old went skiing anyway recently--on his new hip joint. Elliott, a pioneer of Colorado skiing, is not one to pass up a day on the slopes. He has skied powder at Wolf Creek Ski Area every winter since 1934, with the exception of two seasons during World War Ii. He skied powder before Colorado had a single ski area. 'I've been skiing powder here since before they had even started using the word 'powder',' Elliott said with a chuckle as he buckled his ski boots recently. 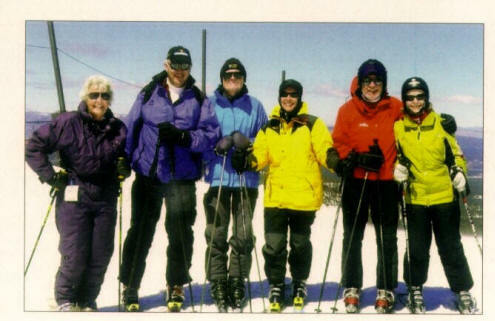 Friends in Wolf Creek's Gray Wolf senior ski group (most of them whippersnappers a mere 75 years old) figured hip-replacement surgery in June might finally end Elliott's run of Wolf Creek's slopes, but he was walking two miles a day just a month later to get in shape for ski season. The life-long resident of Colorado's San Luis Valley arrived at the ski area recently wearing a knit sweater he bought in Aspen in 1949 and carrying a fairly new pair of Volant skis. The Gray Wolves greeted him with a flurry of hugs and kisses. At Wolf Creek's busy base area, he stepped into his skis, slid through the chairlift line--he now skis for free--and took a seat on a high-speed quad cruising silently over groomed runs to a ridge 800 feet above. The scene was remarkably different 75 years ago, when Elliott and a friend threw homemade, 8-foot-long wooden skis in the rumble seat of a Model A Ford and puttered tot the top of Wolf Creek Pass. It was the first winter the twisted dirt road had been plowed. There was not a soul in sight. Elliott and his buddy threw the heavy skis over their shoulders and trudged up through the snow. Skiing was in its infancy in Colorado. Though a few communities had small ski jumps and races, no rope tows or chairlifts were built in the state until 1936. Ski shops were unheard of. Elliott made his first skis from wooden planks, bending the tips by hand after holding them for hours over a steaming kettle on his mother's stove. He waxed them with paraffin from his mother's jam jars. One Sunday in 1936, another skier showed up at the top of the pass. He was a traveling salesman from Pueblo. The trio ate lunch in the salesman's car and he showed the boys a how-to-book on the new sport of downhill skiing. It was the first Elliott had ever seen. He noticed all the skiers in the book had poles. 'What are those for?' he remembers asking. 'They help you turn,' the salesman said. 'You mean you can turn on skis?!' Elliott replied. That night he went home and made poles out of a bamboo fishing pole and his grandmother's embroidery hoops. Elliott said he did not learn to ski well until he was in his 80s. He and his wife, Virginia, had eight children, so he only got out to ski a few times a year for decades. It was not until his wife died in 1991 that he rediscovered his old love. 'It helped get my mind off things, gave me something to look forward to,' he said. At the bottom, his hip was feeling so good that he decided to do it again. He hopes to ski 15 days this season. prior CSW #20: "New shaped skis are just a fad; the fad won't last"
CSW #21: "Old People Can't Ski Well"
next CSW #22: "Kids have to use the wedge more than adults do"
This "Age and Skiing" page last modified 11/03/2017 07:21:36 AM. Did you come here from a link on another website? For latest version of this page, copy to your browser: http://www.SkiMyBest.com/skiage.htm. Copyright © 2013, 2014, 2015, 2016, 2017, 2018, 2019. William R Jones..